Sometimes styling hair can be a challenge. I wear my hair long and sometimes I want an option other than down or in a pony tail. For those of us who want to add a bit of variety or even a bit of stylish glamour to our hair styles, the new scünci bendini clip can help. Perfect for prom, wedding, communion or just to add a bit of sparkle to hair any day, we are introducing the new Scünci Bendini Clips! 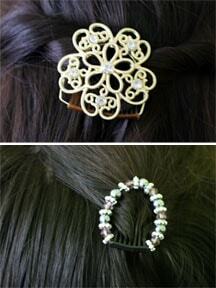 This high fashion hair jewelry adds instant glam in two easy steps, and works on almost any hair length and texture. The scünci bendini is available in three different sizes and a vairety of styles, including jeweled crystals, colorful beads and metallics. It’s also available in the special scünci “girl” line designed especially for the little beauties in your life. Elastic bands can cause “hair-ache” (you know what I’m talking about.) Bobby pins can’t hold a lot of hair in place, so for someone with a lot of hair, you would either need a whole lot of bobby pins, or just another solution. That other solution is the scünci bendini clip. The ﻿scünci bendini clip is an innovative hair clip that actually keeps your hair in place while giving you a touch of style to your hair. It consists of a decorated “clip” on one end, that folds back onto a comb portion that is used to capture the hair between the teeth. I love the jeweled and beaded designs to the clips, that can dress-up a casual outfit our can be worn while out running errands. Our tester used the large clip to style her hair half up and used one of the smaller bendinis to clip back her bangs. To put in the clip, first you gather your hair into the style that you want it, slide the teeth of the comb-side of the bendini into your hair, then bend the jeweled part closed so it snaps into place. Our tester saw a variation of that in the video where you first slide the bendini back (with teeth facing away), then loop it forward (so the teeth face front) and then bend the bendini closed. Both work but the tester favored the second method over the first to ensure all of the hair got caught in the teeth. 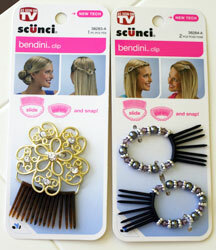 One important thing about the ﻿scünci bendini clip is that it actually holds and keeps your hair in place. With other clips or pins, those tend to gradually succumb to gravity over time, causing your carefully crafted hair style to start hanging lower and lower on your head. With the ﻿scünci bendini clip, the teeth actually fold closed onto your style, effectively locking all of the hair in place until you unclip the bendini. For a fancy or casual way to style your hair, or to keep bangs out of your face, then the ﻿scünci bendini clip is a great option. 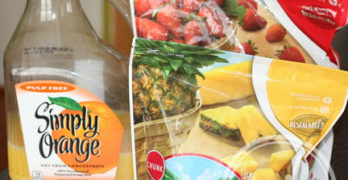 The bendini clip can be found at drug stores and grocery stores nationwide for $4.99 MSRP. One winner will receive THREE bendini clips packs! Leave a comment sharing how you’d style your hair with the scünci bendini Clip. +1 “Like” Scünci on Facebook. +1 if you follow Scünci on Twitter. Giveaway ends at 11:59 PM EST, August 3, 2011. I would wear at evening parties. I’d wear it as a DIY style for my wedding! I’d put my hair in a fancy bun. I would wear it when I go to work. I’d put it in a long ponytail. I like Scuni on Facebook. My daughter has super-long hair and we’d use this to style it in an “up-do” for her first day of school. Mine would be pulled back off my face. I hate my hair in my face! I’d use it to secure my French Braid Headband in place. I’d pull back both sides, make a small bun with the clip. Also I like big buns. I’d put it up in a bun and out of my way like I always do but now I’ll look stylish, thanks. I follow Scünci on Twitter w/ katklaw777. This would be for my daughter, who would use it to pull her hair back and up. 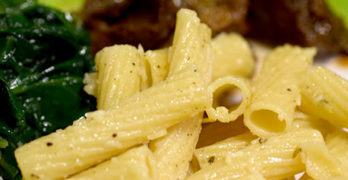 I would incorporate the scunci into a French twist. I have no idea. I usually just put my hair up in a ponytail. This is the first time in years that I’ve let it grow out so I’m still not sure on styling it. I’d use it to hold up a french braid. On these hot summer days I would pull my hair back to get it off my face and neck these clips would certainly dress it up. I’m not sure. I just cut 8+ inches off my hair so, I’d probably put it half-way up. I do a lot of braids, so I’d probably do braids on each side & connect them similar to your above photos. I’ve been wanting to try these! I would style it in an updo. I’d style my hair up with the scünci bendini Clip. I follow Scünci on Twitter.